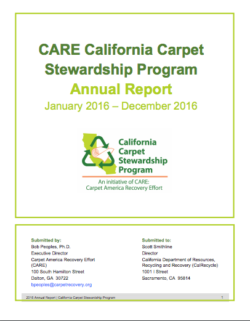 The California Carpet Stewardship Program has released its 2016 Annual Report after submitting it to CalRecycle. Highlights from the fifth year of the Program include modest improvements in gross collection and net diversion of post consumer carpet from landfill. Recycled output, a barometer of market demand for products made with post consumer carpet, increased by 8.6 percent from 35 million pounds in 2015 to 38 million pounds in 2016. This increase resulted in an 11% recycling rate, up 1% over 2015. An average of 25% of all post consumer carpet discards in 2016 were net diverted from California landfills, up from 23% of discards in 2015. Diversion via energy recovery (sum of CAAF, Kiln, and WTE) decreased by 29% in 2016, falling to 21.02 million pounds from 29.73 million pounds in 2015. In 2016, the Program continued to work to improve gross collection of post consumer carpet, which increased by 4%, from 103 million pounds in 2015 to 107.2 million pounds in 2016. This was supported by expanding the number of CARE enabled California drop-off sites to 33 sites servicing 33 counties, up from 23 sites in 22 counties in 2015. CARE estimates approximately 200 private drop-off sites were also operating around the state. The program saw an 8.6% increase in total pounds of recycled output in 2016, up from 35 million pounds in 2015 to 38 million pounds in 2016. This increase contributed to a program recycling rate of 11% in 2016 (recycled output as a percentage of total discards) up 1% from 2015, although fell short of the 16% 2016 goal. Learn more about products made with post consumer carpet here. Recyclability was also supported by the carpet tile recycling subsidy implemented in Q2 2015. 1.12 million pounds of carpet tile was recycled in 2016, an increase of 31% from 2015. The carpet tile/broadloom reuse subsidy also supported a rise in post consumer carpet reuse in 2016, with a 51% increase from 2015 (614,000 pounds) to 2016 (926,000 pounds). Launching the Double GreenTM label to encourage the inclusion of California sourced PCC plus one additional post-consumer recycled material in secondary products. Developing an economic model for analyzing ‘what if’ scenarios. Releasing some $2 million in grant funding for capital improvements, testing, and procurement. Expanding budgets for drop-off site support and outreach and education. See the California Program’s 2016 Annual Report here.